May or may not be of interest to you diyselfers. You hit the same dilemma as me. Many bad batches these days. In fact, all have been bad since last fall it seems. I test a couple thoroughly from each new batch and sadly find they fail. At that point, I just change out 100% of the FETs for that batch. Found failure rate has gone way down to just a few percent since starting this practice. My advice would be to always order a few extra FETs when getting one of these ZVSs and must have some soldering experience. Or know someone that does. Hi Pipes. Thanks for chiming in. Just out of curiousity, my problem definitely seems to be a blown MOSFET right? These are encased under the board covered with that casing right? These NTD4806NG have being working out great. Not the highest specs in the world but good enough for our task. And we know what they are..... lol. Unlike the ones that come with it with no markings. At least not any of the ones I've changed out had markings on them. Swapping them out for these should fix the problem? Do you have a spec for these? Maybe I can find some locally instead of waiting for the 20+ days of shipping. Yes, it's the FETs are gone. The reason is most likely quality issues but look for cold solders as well. I've gotten use to changing them. Twist those big coils as much as they will go so you can access the legs. Use hot iron with needle tip in good condition and put under each leg and prey up until lifts off the board. The good news is that the solder bath is so bad they lift easy. Once the two legs are lifted, heat behind the heat sink at the other end. Again with hot iron. Applying a tad of solder will speed up the process. Apply side force until it slips off it's location. Solder in new ones. I wedge under the big coil and use the coil to hold in place while I dab solder on the legs. Then solder the heat sink portion back on. Clean up and check work before firing. Also, remember to never fire up without the work coil installed. Just google specs for NTG4806NG. I'm sure DigiKey or alike will have them. AtomicPB, tuuwie and GreenHopper like this. Hi, thanks for linking to this here. I am the OP of this post on Reddit and the linked Imgur album of the built unit, and that's my build. It works great and I am very happy with it. As I said in my notes in that post, I am definitely aware the hard work and trial and error you guys and gals in this thread did to get things to this point. Thanks! My build. 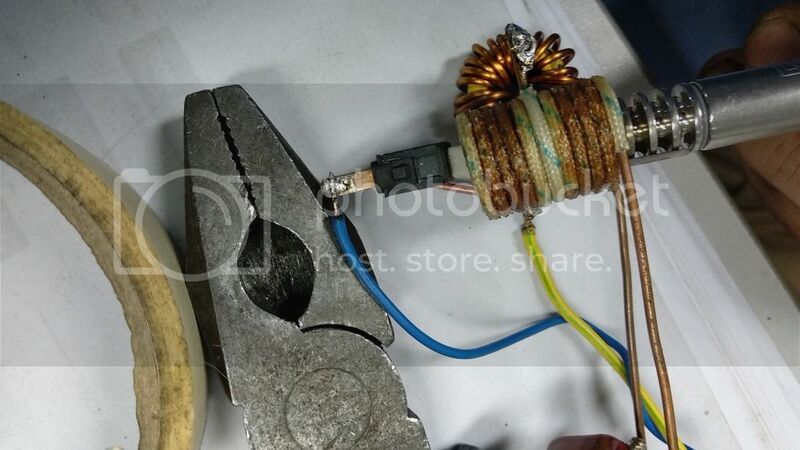 Notable points: momentary switch under coil, MOSFET board and wiring under unit. Works great. DVision44, natural farmer, AtomicPB and 7 others like this. 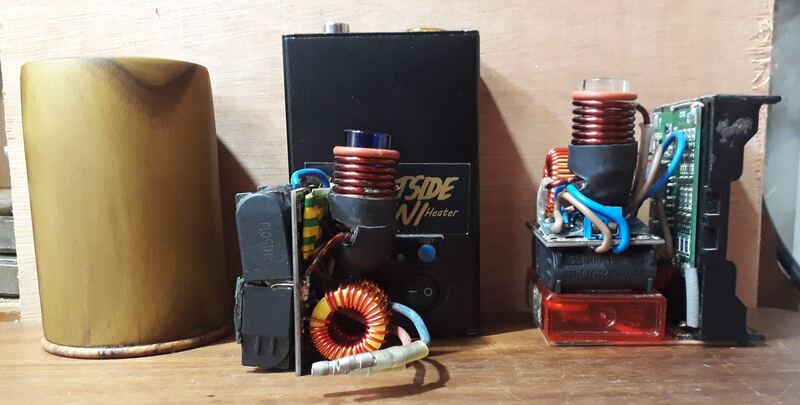 I make a new circuit and have some testing the position of the vap in heater. Case 1 the vap tip inside the coil. Case 2 the vap tip outside the coil. frankbhelger, AtomicPB, GreenHopper and 4 others like this. 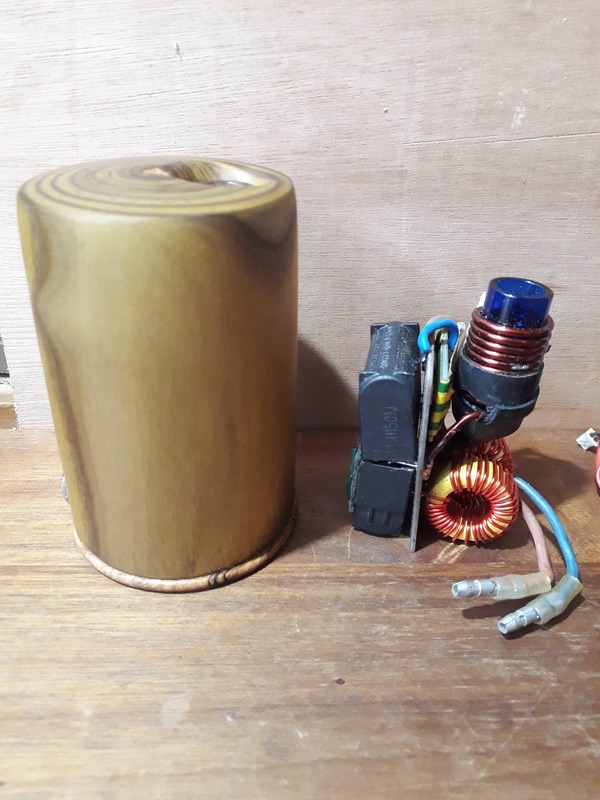 When my induction heater used to work, I had it set to position 1 with 5-6 second clicks. GreenHopper and zhong8051 like this. @Squiby, @Summer, @Ramahs and @Blu. I'll answer your question here. This is the way my first Skelly was put together, it's now in the Sumac with a DC jack instead of batteries. I'm probably going to make a desk top one up for when I'm in the shed. After I've finished this Mini version off, apologies for the focus. To get the 'log' style heater involves a reposition of the coil. This is done to keep the diameter down. If I was to 'log' a Skelly I would be inclined to put the heater on top of the battery sled, this means I can make an access door in the base. It also means they would end up more cone shaped. I'd be happier retro fitting them than sending out an enclosure and hoping that the end user could fit the heater properly. No idea on a price or time frame. Not having the tools or space makes them an involved build. Cl4ud3, Blu, AtomicPB and 13 others like this. You’re on the path of our earlier conversation. Love it!!! 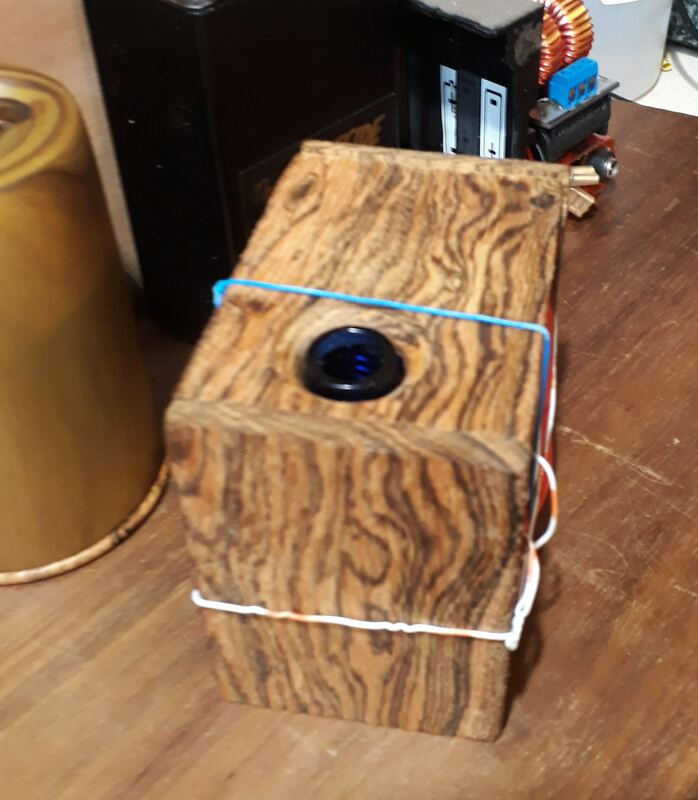 @phattpiggie the second you want to retro fit a Portside Mini with a wood enclosure, you let me know!! Blu, Squiby, Mr. Me2 and 2 others like this. @Squiby, @Summer, @Ramahs and @Blu. I'd want something like that for home-use, so no battery sled needed. Just DC, as I'd never put batteries in it anyway. ClearBlueLou and Squiby like this. Hey @phattpiggie, do you change out the FET's on the ZVS Heating circuit too? If yes, which ones have you had good experiences with? Vgs threshold should be low, below 4v. Below are some examples of ones that I've found to work well (and are probably over-kill in some aspects). There must be thousands/hundreds available that would work, and if you have any sort of large electronics component store in your area they're likely yo have at least one. So look around for what you can find that looks relevant and ask us what we think. KeroZen, AtomicPB, Pipes and 5 others like this. Thanks so much for linking me with this info. Will ask around and let you guys know the MOSFETs available here. 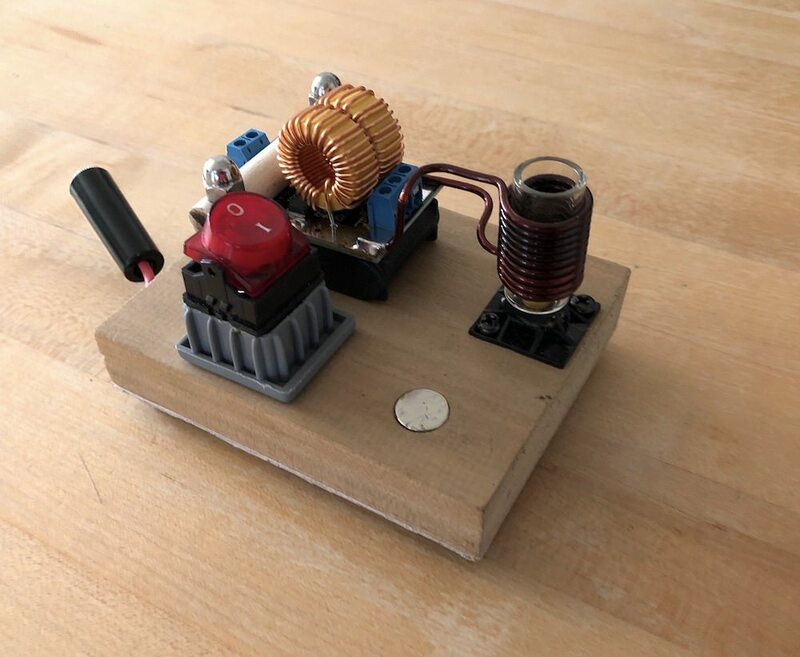 Any chance you guys happen to have a circuit diagram for the ZVS Induction Heater? I have been looking around and haven't found any part numbers / datasheets / circuit diagrams. The ones i've found, I am not sure match the spec of the heater I have thanks to the lack of knowledge on my part. I was looking for it in case I have to take this blown one to a friend to replace the MOSFETs. Paraiso, Mr. Gusto Himself, AtomicPB and 4 others like this. in general, google Royer oscillator / Mazilli flyback driver. @zhong8051 looking good. Keep up the builds ! The fast click in your second video is due to the shallow insertion. Since the bi-metal disc at the end of the cap (that does the clicking) is actually being induction heated itself, it heats up quickly and clicks. This does NOT indicate the actual chamber temperature. It is more likely to result in slight charring of any material touching the end of the cap, and a tip that cools down way too quickly since the rest of the tip doesnt get a chance to heat up enough. Your first video's insertion depth looks much better. What are you measuring there, Amps @ 120 / 220 V? Either way thats some powerful stuff. How much capacitance do you have on there? Got an oscilloscope? KeroZen, Paraiso, GreenHopper and 3 others like this. I using step down from 24voltDC to 12volt DC. The ampe meter measuring DC ampe, 4x330nF 400V. I dont have oscillos. What you want see on osc ? Wow, that was quick. Thanks so much for sharing this man. Really makes my life so much simpler. 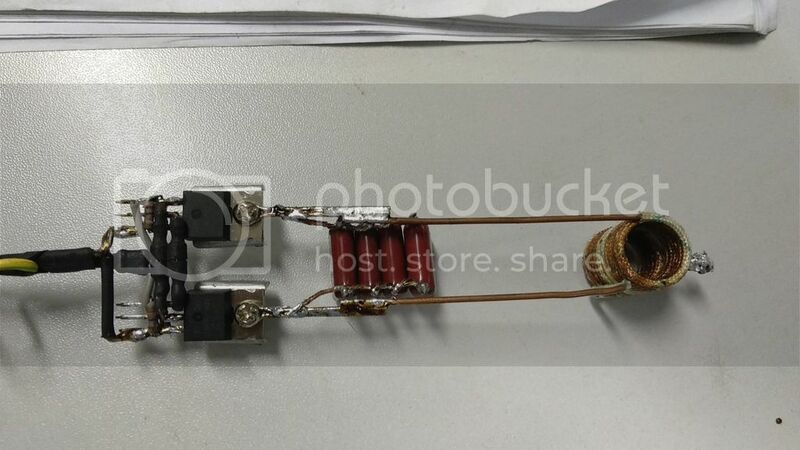 Will try and swap out the MOSFETs of my busted induction coil and will share the MOSFET components i am able to source here. I am sure it'll be similar to one of the ones you've linked. Thanks again. Much appreciated. @zhong so thats about 7.5A @ 24Vdc? ~180Watts. Assuming 90% efficiency in the step down that's still over 150W delivered to the IH. Those transistors must be getting toasty. You could try reduce capacitance. 0.33~0.66uF range should be good depending on your coil. I'd experiment a little there, maybe use 2x0.33uF in series for 0.66, then parallel with another 0.66 string to give you 0.33 (using just one of those 0.33's alone may cause too much heating in the single capacitor), or just use two in parallel for 0.66uF. Reducing capacitance will INCREASE the self oscillating frequency which will INCREASE switching losses however it will also increase both the capacitive and inductive reactance (Xl == Xc), which causes general current consumption to DECREASE. There's no need to heat up the vapcap TOOOOO quickly, which often results in burnt loads anyway. An oscilloscope will show you the frequency, which should be around 20~30kHz, and help you tune your coil/capacitance, but is not entirely necessary. EDIT: Corrected a backward statement about frequency behavior above. frankbhelger and KeroZen like this. Temperature of transistors is under 60*C I think is not too high because we using IH with shot time. yo - but when you have a session then you maybe heat up repeatetly over lets say 3-5 minutes. can you simulate a "session" and monitor the transistor temp? 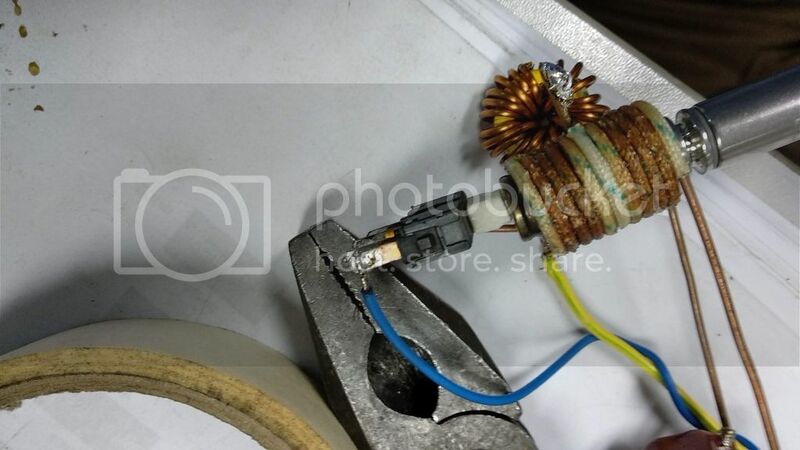 Just realised I completely missed this post and I am back to report that after careful analysis, the FETs on the heater seem to have cracked and completely busted. I am checking for the ones you linked earlier and also for the ones @rz linked as well in the open market for a quick replacement. Hopefully the FETs are the only things I fried and the rest of the heater circuit still is intact. @tuuwie I went back thru my fet purchases and I went with these. GreenHopper, V-apE and tuuwie like this. Good idea. Will give this a shot for sure once I get more confident about these solders.